Department store lighting makes me die a little inside, but this is the only way I can get you information as soon as I get it. 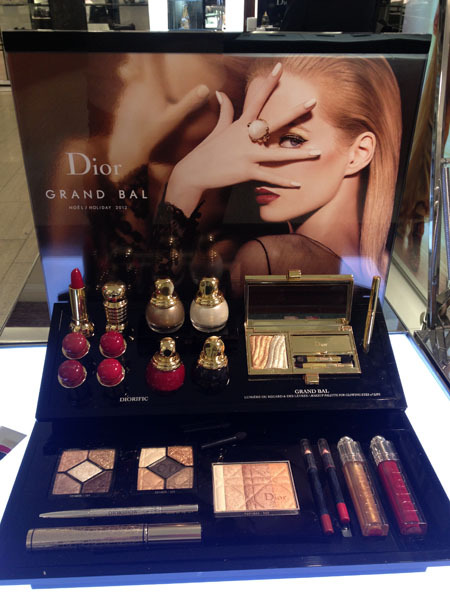 Below are guerrilla swatches of Dior Grand Bal Collection for Holiday 2012. The star of the collection is the Grand Bal Palette, inspired by the dance cards held by 18th century young women to keep track of their dance partners. It includes an eyeshadow duo of platinum and gold, two glosses, and one black eyeliner. 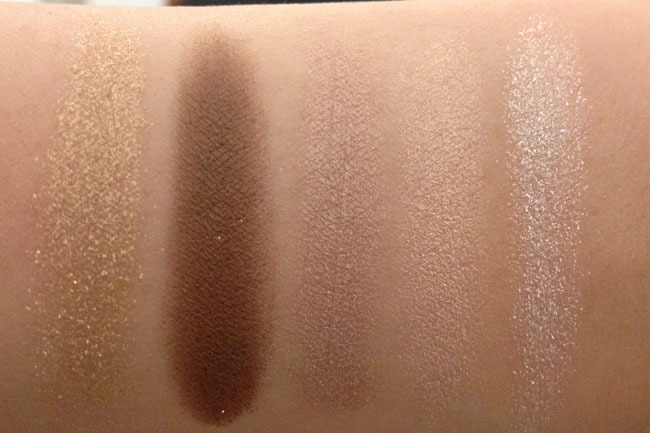 The eyeshadow is super pigmented and creamy (the photo above is just one swipe). 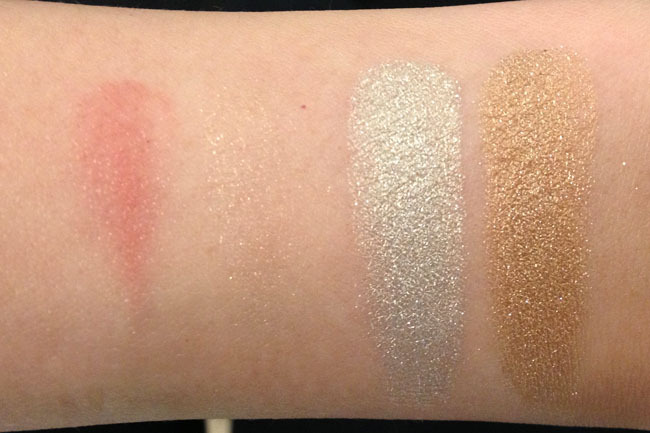 Texturally, they feel like the new Estee Lauder shadows. The glosses are a shimmering warm pink and a pearl white. As you can see, they're both very sheer. I didn't manage to swatch the black eyeliner since the counter's tester was glued down. The eyeliner is supposed to slide through the rings and hold the palette closed. According to the press release, the palette is a "must-have for the modern party girl," but I feel like having that mechanism is going to be such a hassle for touch ups that it wouldn't be worth it. The two eyeshadow palettes in Fairy Golds and Night Golds are Dior holiday staples. I recall similar offerings from the past couple of years. Both are pretty, but I suggest a quick stash inventory before you buy. 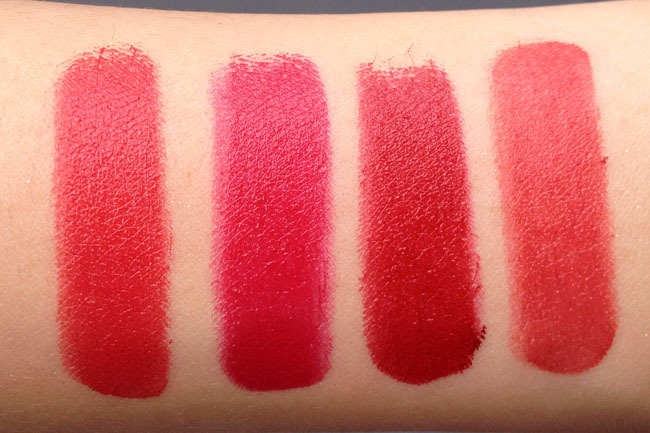 Diva is a coral-tinged red, Marilyn leans fuchsia, Diorling is a true red, while Lady is a comparatively sheerer, watermelon red. Lame Gold is a gold gloss with gold glitter. Ceremony Red is red with microshimmer. All in all, pretty but predictable. I wish a brand would come up with a holiday collection that didn't involve red and gold. I mean, year after year, how many gold glosses do we really need? Especially when we know pretty much every brand in the department store beauty level will be coming out with one. I suppose it's safe from a brand's perspective, but as a consumer it's creatively unsatisfying. 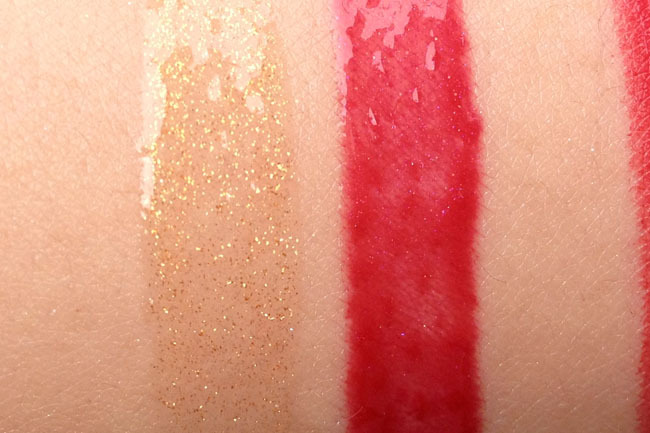 I swatched the collection at the Dior counter at Saks Fifth Avenue New York. If you'd like to order yours now, you can contact them at 212.940.2181. Do tell them I sent you! I want the Diorific lipsticks just for packaging, but I'm not a bright red lipstick wearer so I'd never get any use out of them. Maybe I could wear Lady if I sheered it out a bit? Gold glosses maybe not, but gold eyeshadows? Heck I'd use them all-year-round! 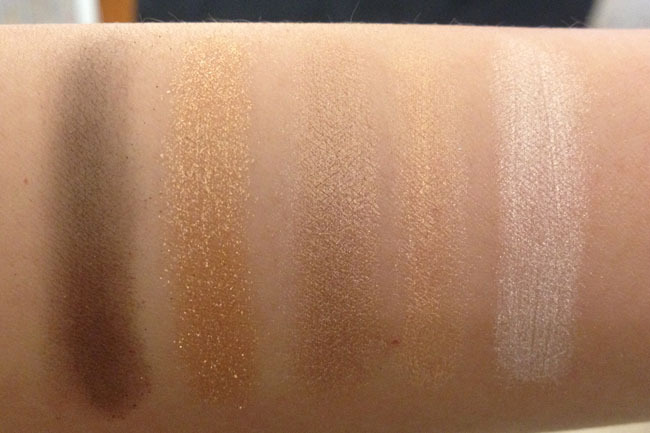 Thanks for the swatches Xiao! Again things are super slow here. We won't get it for another 3 weeks! I picked up Marilyn and the nail polish in Diorling. Love them both - Marilyn especially is super gorgeous. I'm addicted to reds. I saw the whole collection including the palette at Macys Herald Square in Manhattan so I'm thinking it's not an exclusive. The palette really isn't for me so I'm going to wait for Guerlain's calligraphy palette instead. rebecca- Maybe! Definitely give it a try. Sunny- hahaha yeah I can see you doing that! It's not so much the goldness of it than the predictability. I mean, try red and white, maybe? Interesting, thanks for doing these swatches! I agree, I wish companies would get a little more creative with christmas collections. You are so right: snore fest! Yea, same here. I was like haiz, as if I don't have enough red and golds. Karima- Right?! I'm currently wishing for a good pigmented white shadow. That could work for a Holiday collection! Arianne- That's a new word that I'm going to start using NAO. Jyoan- Black and gold would be fun too, if they had to keep one element. memoiselle- I got one nail polish, and I'm starting to warm up to the red gloss, but that's it! I do not know which holiday makeup to get, Dior, Guerlain, or YSL? They all have pretty offerings. I do like golds, so maybe Dior or Guerlain.